Every December the people of Japan select a kanji character that best sums up the social and political zeitgeist of the previous 12 months. After a year dominated by the regional nuclear crisis, there was perhaps only one serious candidate for word of the year 2017: north. 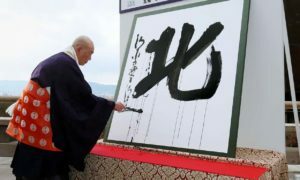 The single character, pronounced kita in Japanese, encapsulates the country’s unease over North Korea’s advances in developing a nuclear arsenal, according to the Japan Kanji Aptitude Testing Foundation, which organizes the annual poll. Previous kanji of the year have similarly reflected conflicting sentiments among the Japanese public. In 2016 they went for kin – a celebration of Japan’s 16 gold medals at the Rio Olympics, but a reminder too of the resignation of Tokyo’s governor, Yoichi Masuzoe, over an expenses scandal.